Teach sorting, classifying and ordering. The blocks are also great for developing the concept of logical thinking. 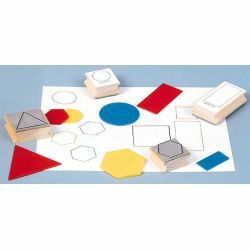 This set includes 5 shapes in two sizes: circle, square, rectangle, equilateral triangle and hexagon. Stamp images are the actual size of attribute blocks.